5 years ago, the WSEAS Journals became entirely independent from the WSEAS Conferences, so they achieved to be candidates in ISI Web of Knowledge (all the WSEAS Conferences and Books have been already indexed in ISI Web of Knowledge). Authors upload their papers to WSEAS Transactions regardless of whether they have attended a WSEAS conference or not. Also the WSEAS Transactions are the only open access journals in the world where the Authors do not pay any kind of registration fees or publication fees or "donation" ( the full PDF files of the papers are permanantly open for everybody, without any restrictions, while the authors are not charged with any kind of fees). The Editors-in-Chief, being assisted by the members of the Editorial Boards, are the absolute decision makers for the acceptance or not of the papers. 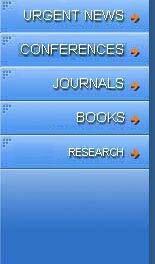 NAUN: European Conferences indexed by ISI, EI Compendex, etc..
NAUN: European Conferences indexed by ISI, EI Compendex etc..